A leading opposition activist in the south Russian city of Orel has been sentenced to ten days of police detainment despite a row of contradictory circumstances, testimony, and questionable behavior on the part of the judge and police involved in the oppositionist’s arrest, Kasparov.ru reports. 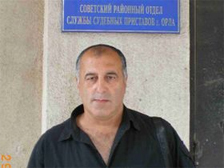 Georgy Sarkisyan, a leader in the regional branches of both the United Civil Front and Solidarity opposition movements, was first arrested on June 30. At the time, police blamed the activist with attempting to steal a cell phone – a charge that Sarkisyan and his representative, civil rights advocate Dmitry Krayukhin, dismissed as a “provocation.” On July 1, Judge Svetlana Sandulyak sent word to local police that the files submitted on Sarkisyan’s arrest were not in order. Beginning on the evening of July 5, police repeatedly attempted to enter the oppositionist’s apartment, and detained him on Tuesday morning as he tried to enter a taxi. While the police told Sarkisyan that they had a subpoena to bring him to court, they failed to present a copy of any such document. Later that day, Judge Sandulyak convicted the opposition leader of “hooliganism,” although what exactly this accusation entails was never clarified to either Sarkisyan or Krayukhin. According to the rights activist, Judge Sandulyak is guilty of grossly violating the oppositionist leader’s rights. Sarkisyan was not informed until very late of the precise time and place of the judicial proceedings, and thus was unable to present witnesses in his defense. Moreover, the prosecution’s case includes obvious contradictions and inconsistencies that the judge seemed uninterested in clarifying, he said. “The case materials speak of one place where an offense to the law occurred, and witnesses from the prosecution speak of a different place, but this does not in any way worry the judge,” said Krayukhin. The rights advocate also said that Judge Sandulyak “made strange inferences.” For example, she took Sarkisyan’s testimony that he was walking along one street as evidence that he committed a crime on an entirely separate one. Georgy Sarkisyan has recently proven to be a thorn in the side of Orel’s local government, due to his offer of consultational and organizational support to a group of merchants who began to be evicted from the city’s central market in May. The evictions came despite a promise from the mayor during his electoral campaign two months earlier not to do so. On July 1, when 700 market pavilions were officially closed, six merchants began staging a hunger strike that is still going on today.